The AL3 process imagines each product we create as part of a continuous cycle, which allows us to manage multiple, smaller parts or phases of a project as independent products. DEFINE: We get a detailed idea of the problem(s) to be solved, and what ideas a customer may have on how to solve them. We identify all goals and guardrails. COLLECT (DISCOVERY PROCESS): We gather all existing customer data, diagram customer processes and look at existing solutions. BRAINSTORM AND ANALYZE: We look at opportunities to fine tune processes and map out proposed workflows for customer review. DEVELOP: We code, code, and code some more. PRESENT: We present a preliminary solution to our customer, reviewing the functions and interface, and collect feedback through user testing. 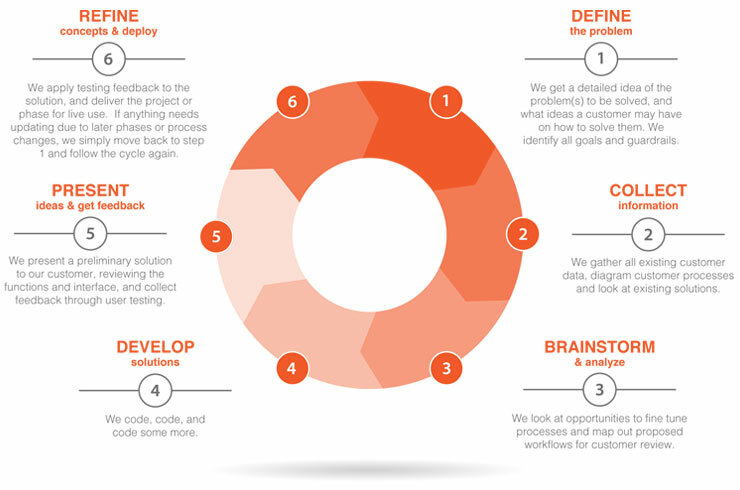 REFINE: We apply testing feedback to the solution, and deliver the project or phase for live use. If anything needs updating due to later phases or process changes, we simply move back to step 1 and follow the cycle again. Allan Mowat and his team at AL3 Technologies has done an incredible job building and maintaining an extremely complex database for our business. A couple of years ago our entire business model began to change as we became a volume content supplier to a number of digital video platforms, primarily Amazon Video but others as well. To take advantage of a complex royalty revenue-share model employed by our video platform clients we needed to build a completely new database solution, one that would ingest hundreds of thousands of viewing and transaction records, for tens of thousands of pieces of video content, and then track and provide detailed reporting to over several hundred content partners, all on a monthly basis. Throughout two years of ongoing development, AL3 Technologies had to manage multiple data reporting changes from our video platform clients and solve problems quickly in order to keep our content partners paid accurately and on time. When our reporting requirements needed to quickly adapt to include global territories, AL3 Technologies’ solution proved flexible enough to adapt to such changes. In addition to the royalty reporting component, we also needed a JSON API to sync our FileMaker database with our business-to-business website. AL3 handled that component with aplomb as well. Our AL3 Technologies -designed FileMaker solution has proven to be a robust and capable platform for what is, without doubt, one of the most complex royalty reporting systems employed in the media business today. Allan and the AL3 Team are now an integral part of our Janson Media team.